Like most things in the business world, if you don’t have a strategy in place for your digital marketing, it can be hard to determine if you are spending time (and money) on the right types of marketing activities. Getting to know different marketing strategy examples can help you better understand what needs to go into your own marketing strategy. Reviewing different marketing strategy examples and tactics can also help you better determine what types of marketing are a good fit for your business. When you know which types of marketing will benefit you most, then you can work to spend your time and resources on the activities that will provide the best return on investment for your business. But first, you’ve got to know what a digital marketing strategy is and what goes into developing one. Below, we’ll start by discussing what is a digital marketing strategy and dive into the pros and cons of developing your own defined marketing strategy for your business. Then, we can go through a few different marketing strategy examples and help you decide which types of marketing strategies and tactics are a good fit for your own business. A digital marketing strategy is a comprehensive document that helps guide the direction that your marketing should take. Your marketing strategy should take into account your company’s overall goals and objectives while laying out a plan for how your marketing will help you meet those goals and objectives. There are many different pieces that make up the digital marketing strategy puzzle. There is no one size fits all option when it comes to a marketing strategy. That’s because every business has different products, services, audiences, and goals. When developing your own marketing strategy, consider where your business is now, how you’ve performed in the past, and where you would like to be. From here, you can think about how marketing will help you reach your goals while taking into account what strategies or tactics you’ve used in the past. Research – Before you start planning anything, you need to do some research on your market and your competitors. This will help you better understand what’s already out there and what types of marketing your competitors are using to reach their target audience. Target Customers – You will also need to research and get to know your target customers. What does your ideal buyer look like? Go beyond just basic demographic information and include some details on their buying behaviors, preferences, and greatest motivations. These three elements are a great place to start in defining your digital marketing strategy. Before we get into different marketing strategy examples, let’s talk about why you need to have a defined digital marketing strategy. When we say “defined,” we mean that the strategy is clearly laid out in some type of document. It isn’t just something you talk about or assume that every team member is on board with. Your digital marketing strategy should be organized and written down in a document that’s accessible to everyone on your marketing team. It helps you understand your customers. All of the research that you put into developing your digital marketing strategy will ultimately help you better understand your customers. The better you understand your customers, the better you can serve them with products and services that meet your needs. You will also be able to better reach and engage them online through different marketing tactics. The strategy will guide all of your marketing efforts. 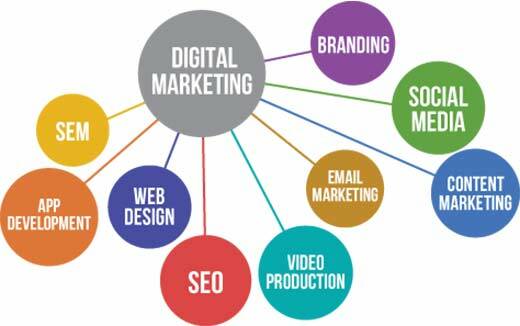 Your digital marketing strategy serves as a guide for all of the marketing activities that you spend time on. Rather than getting caught up on something small, you can use your strategy to see the bigger picture and better understand how all the different tactics work together to help you promote your brand online. A clearly-defined strategy keeps everyone on the same page. A clearly defined strategy helps ensure that everyone on your team is on the same page when it comes to the overall direction of your marketing efforts. The strategy helps answer questions about why you are choosing to implement certain tactics and how they will benefit your business in the long run. With a strategy, you can have measurable results. The only way to know for sure if your marketing tactics are working is to measure your results. The marketing strategy allows you to develop specific benchmarks and goals to help you better understand how your marketing tactics are working for your business over time. A strategy can help improve your ROI. Overall, a digital marketing strategy will help you improve your return on investment. By strategically choosing the marketing tactics that are right for your business, you can ensure that you’re spending your time and money on the tactics that will provide the best ROI. It’s important to note that we really think your business will benefit from putting together a solid digital marketing strategy. Having worked with businesses big and small from a variety of industries, we know the value that a clearly defined marketing strategy can provide. Those who have one are always more successful than those who take a “fly by the seat of your pants” approach to marketing – with no plan, research, or consensus behind their tactics. With that being said, there are still a number of businesses out there that just haven’t taken the time to create a defined digital marketing strategy. In fact, a survey from Smart Insights shows that 50% of the businesses surveyed didn’t have a digital marketing strategy. Even with all the benefits, 50% of businesses still don’t have a clearly defined strategy for marketing. It takes too much time. Developing an effective digital marketing strategy takes time, effort, and resources. However, putting in the time to develop an effective marketing strategy in the beginning can prevent you from wasting time later on pursuing marketing channels and tactics that aren’t helping your business. Research is hard to find. An effective marketing strategy requires a lot of research and analysis of your product, market, competitors, and customers. Sometimes this information can be difficult to find. But remember, the more information you have at your disposal, the more strategic you can be about your marketing tactics. You have to update it. Another factor that may be seen as a con to developing a marketing strategy is the fact that you have to update your marketing strategy over time. It’s a living document that will change and grow as your business changes and grows. Sticking with the same marketing plan isn’t effective when your business starts to evolve. A strategy requires expertise your business doesn’t have. Yet another reason why some businesses avoid putting together a strategy is that they don’t have the expertise in-house to develop an effective plan for marketing. That is where partnering with an agency that provides digital marketing services can come in handy. A marketing agency like LYFE Marketing will help you develop a researched marketing strategy to ensure you are using the best tactics for your business. Though there are certainly some reasons why you may be hesitant to develop a marketing strategy, it’s clear that creating a defined strategy will benefit your business more than it will hurt it. The more time you set aside to develop and improve your strategy, the more time and resources you can save on later by investing in the right marketing tactics the first time around. Now that you know what a digital marketing strategy is and how having a defined strategy can help you achieve your business goals, let’s talk about how you can implement this strategy. As part of your overall strategy, you’ll have several marketing tactics that you will use to reach and engage your customers. Think of your digital marketing strategy as the big picture plan that will help you achieve your overall business goals. The marketing tactics are the tools or actions that you plan to take to implement the overall marketing strategy. These can include the marketing channels and resources that you’ll use when marketing to your ideal customers. Some marketing tactics will require their own strategy, like SEO for example. (But we’ll get more into that later.) Below, we’ll outline just a few of the different digital marketing strategy examples. We’ll also give you the information you need to decide which types of marketing will work best for your company, depending on your unique goals and characteristics. One of the best marketing strategy examples that works for nearly all businesses is blogging. Blogging involves writing and publishing content online on topics that are relevant to your business. Blogging helps businesses generate more leads because it improves their visibility online while also providing quality information that helps customers make smarter purchasing decisions. Blogging is one of the best ways to improve your SEO and rank higher on the search engine results page. Blogging is a very important marketing tactic for search engine optimization (SEO). The more quality and relevant content you have on your website, the more pages that search engines like Google can index. This means that you have more opportunities to appear in online searches that are relevant to your brand. Once a target buyer searches for a relevant keyword on Google, they may come across your brand’s blog post on the topic. When they click on the link, they are lead to your site, which exposes the customer to your brand. It also gives you the opportunity to educate and build trust with the customer through the educational content you provide. You may be wondering, how can I tell if blogging is right for my business? Well, as we said earlier, blogging can benefit virtually any type of business. No matter what industry you are in or what type of product or service you sell, you can benefit from educating your customers and improving your SEO through blogging. And the best part is… you can start blogging today! All you need to get started is a blogging platform, a good idea, and someone to write your content. Most businesses will put their blogs as a section on their website because that is the best way to improve SEO and drive more search engine traffic back to your site. When it comes to ideas and writers, start by looking within your organization. Some businesses don’t have time to develop their own blog content. Others may not have anyone on their team who can research and write quality content. If that’s the case, you may want to work with a digital marketing agency that provides blog writing services. That way, you can get the quality blog content you need without having to worry about finding someone to create and manage it. Social media marketing is another one of the best marketing strategy examples for businesses of all sizes. Many consumers are using social media channels on a daily basis to communicate with friends, stay current on what’s happening in the world, and even get news and updates from their favorite brands. If your business is not on social media, you’re missing out on a powerful opportunity to reach your target customers. It’s clear to see that many people are using social media even while on the go. There are a lot of different elements to social media marketing. The first is posting quality content. This content can be updates from your business, including promotions, special offers, sales, or other deals. However, you can also use your social media channels to promote different pieces of content that you’ve created like your blog posts or eBooks. Another element of social media marketing is engagement. There is no point of being on social media if you aren’t going to be social. Your business needs to engage your fans and followers by asking them questions, addressing their concerns, answering their messages, and starting a conversation in the comments section. Social media marketing is a strategy that can be used by any business that wants to engage their audience and start a conversation with target buyers online. Most consumers are active on at least one social media channel. Many will even follow their favorite brands to engage with their content and posts over time. The question is not about whether you should be on social media, but rather which social media channels you should be on. Every business has a different target market, and those target buyers have different preferences when it comes to social media. Rather than trying to be everywhere at once, find the channels that your target customers frequent and spend time engaging with them there. Again, not every business has the time, resources, or expertise to be effective on social media. Though you may have your own social media channels for personal use, the rules and best practices are different when it comes to social media for business. If you need help building a social media presence and engaging your followers, check out our social media management services. Email marketing is an effective way to reach and engage your customers wherever they are. Not only do most consumers have an email address, but many actually enjoy hearing from businesses through email content. Once you have a list of email contacts and you’ve gotten permission to contact them, you can send out a variety of different types of content from promotional offers to informative newsletters. It’s clear that email marketing can have a powerful impact on your company’s bottom line. The key to effective email marketing is to segment your customer lists. This involves separating your contacts into different lists based on certain characteristics or preferences. Then, you send each list the types of content that they would most be interested in. For instance, you might send emails with certain types of products to the customers who are most likely to buy those products. Email marketing is one of the most powerful marketing strategy examples for businesses of all types. Email marketing works well for nearly any business because most consumers have an email address. And they check their inbox daily. This allows you to reach the greatest number of consumers at one time. Email marketing is also beneficial because it is cost effective. Creating and sending emails out to your contact list doesn’t require a significant investment. Email is also instant. You can push out an important message to your contacts immediately, and they will receive it directly to their inbox. But sending a marketing email is not the same as sending an email to a co-worker or loved one. It takes a little time and skill to put together an impactful message and attractive design. If you don’t have the resources in-house to create effective email marketing, consider working with an agency for email marketing or an email newsletter service. Pay-per-click or PPC ads are another great example of a marketing tactic that can help your business boost visibility online. PPC ads are ads that appear on the top of the search engine results page. When you create these ads through Google Ads, you bid on certain keywords that are relevant to your content. When a consumer searches for these keywords on Google, they will see your ad at the top of the page. Though SEO is an important part of your marketing strategy, PPC ads can also help improve your search efforts. The greatest benefit of PPC ads is that they help improve your visibility on the search engines. Most consumers don’t scroll past the first page of the search engine results. And many of those search engine users stay within the top few results. PPC ads appear at the top of the search engine results page, ensuring that search engine users see your company’s ad before they look at anything else. Are PPC ads right for your business? Though pay-per-click ads may be one of the most impactful marketing strategy examples, are they really right for your business? One of the major benefits of PPC ads is that they can help provide more immediate results. While your SEO efforts take a while to work their magic, PPC ads drive instant traffic from the search engines back to your site. This makes PPC ads a great option for businesses that need to accelerate their marketing. PPC ads are also a great option for businesses that want to invest in paid marketing strategies. There are many different paid marketing tactics that can help your business see results. However, PPC ads are one of the best ways to improve online visibility. By appearing at the top of the search engine results page, PPC ads can help you drive more traffic back to your site for relevant search queries. It’s important to note that pay-per-click advertising can become a bit complex. Every time a person clicks, you are being charged. This makes it vital that you understand the intricacies of PPC ads if you want to get the most out of your marketing budget. If you don’t have a PPC expert on your team, consider hiring a Google Ads agency that has the expertise to ensure that you are getting the most out of your marketing spend. Now that you understand what a digital marketing strategy is and why it’s important, it’s time to get started creating your own. A clearly defined digital marketing strategy will help keep your entire team on the same page when it comes to how you will market your business. Don’t forget to use some of the marketing strategy examples we’ve provided above as a starting point for your business. If you need help getting started, don’t hesitate to contact us. Our team at LYFE Marketing loves helping brands develop and implement a digital marketing strategy that promotes growth and helps boost their bottom line. Let’s chat!